The Cards - NVIDIA GeForce FX 5800 Ultra: It's Here, but is it Good? NVIDIA GeForce FX 5800 Ultra: It's Here, but is it Good? In NVIDIA's usual style, there will be two flavors of the GeForce FX available in February - the GeForce FX 5800 Ultra and the regular 5800. The GeForce FX 5800 Ultra will retail for $399, just like ATI's Radeon 9700 Pro; we'd expect street prices to be a bit higher than the 9700 Pro, at least initially. As NVIDIA originally claimed, the FX 5800 Ultra will be shipping with a 500MHz core clock at 1GHz memory clock (effectively 1GHz that is). 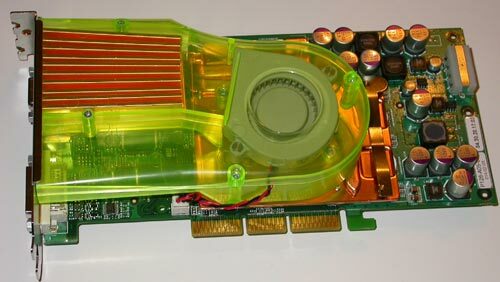 The card we received is what will be shipping in February and features the unique 2-slot cooling solution that NVIDIA shocked everyone with at Comdex. We'll talk about cooling in a bit but just by looking at the card you can tell that the GeForce FX 5800 isn't cheap to manufacture, not by a long shot. All of the materials that go into the cooling system and mounting it on the card definitely increase manufacturing costs well beyond what ATI's board partners have to deal with, so it will be interesting to see if street prices for the GeForce FX will be able to rival those of the 9700 Pro. 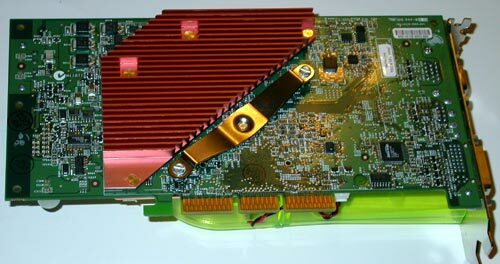 The 0.13-micron NV30 GPU and its 1GHz memory are power hogs and thus the 4-pin standard HDD power connector are present on the PCB. If you fail to plug in the power connector the card will still function and it will let you into your OS without any problems. The card will underclock itself from the stock 500/1GHz settings to 250/500MHz; assuming that the GeForce FX's drivers are installed a window will pop up reminding you to plug in the power connector. The regular GeForce FX 5800 will be priced around $299 and ships with a much lower 400MHz core clock and 800MHz memory. By reducing the core and memory clocks, NVIDIA's board partners should be able to produce regular 5800 solutions in a single-slot design although none were ready at the time of this review for us to include pictures of. We did include benchmarks at 400/800 to give you an idea of where the performance of the regular 5800 will lie.